Bogotá (officially Bogotá, D.C. for "Distrito Capital," meaning "Capital District"), formerly called Santa Fe de Bogotá, is the capital city of the South American nation of Colombia, as well as the largest and most populous city in the country. The inclusion of its metropolitan area, the municipalities such as Chía, Cota, Soacha, Cajicá and La Calera, brings its population to well over 7 million people. 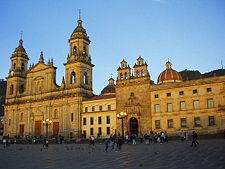 Bogotá is the educational, cultural, commercial, administrative, financial, and political center of Colombia. As with many large, cosmopolitan cities, it is a city of diverse contrasts, both economically and culturally. Often referred to as the "Athens of South America" for its cultural and scientific institutions, Bogota is a flavorful mix of its Spanish, English and the indigenous peoples' heritages. Before the arrival of the Spanish, the area near present day Bogotá was sparsely inhabited by the indigenous Muisca. They were master goldsmiths who are thought to have originated the myth of El Dorado with their tradition of rolling their new chief in gold dust. The area of present-day Bogota was originally called Bacatá by the Muiscas meaning “planted fields.”  It was the center of their civilization before the Spanish explorers colonized the area, and it sustained a large population. The European settlement was founded on August 6, 1538, by Gonzalo Jiménez de Quesada who quickly dispatched the local Muisca tribes, and named the area "Santa Fé de Bacatá" after his birthplace Santa Fé and the local name. "Bacatá" had become the modern "Bogotá" by the time it was made the capital of the New Kingdom of Granada, which was then part of the Viceroyalty of Peru, and later of the Viceroyalty of New Granada. The city soon became one of the centers of Spanish colonial power and civilization in South America. The city of Bogota, Colombia has been called the "Athens of South America"
The city expanded rapidly after 1940 as large numbers of rural Colombians migrated there in search of greater economic opportunities. It is sometimes called the "Athens of South America." In 1956, the municipality was joined to other neighboring municipalities forming a "Special District" (Spanish: Distrito Especial). With the Constitution of 1991, Bogotá was confirmed as the Capital of Colombia acquiring the name "Santa Fe de Bogotá," and changing the category from Special District to "Capital District" (Spanish: Distrito Capital). In August 2000 the capital's name was officially changed back from "Santa Fé de Bogotá" to the more usual "Bogotá D.C.."
Downtown from Salitre Magico Park. Bogotá is located in the center of Colombia, on the east of the "sabana de Bogotá," 8661 feet (2640 meters) above sea level on a plateau of the eastern mountain range of the Andes. Although "sabana," as it is popularly called, is literally "savanna," the geographical site is actually a high plateau in the Andes Mountains. The extended region is also known as "altiplano cundi-boyacense" which literally means "high plateau of Cundinamrca and Boyaca." The Bogotá River crosses the 'sabana' forming Tequendama Falls to the south. Tributary rivers form valleys with flourishing villages, whose economies are based on agriculture, raising livestock and artesian production. The 'sabana' is bordered to the east by the Eastern Cordillera of the Andes mountain range. 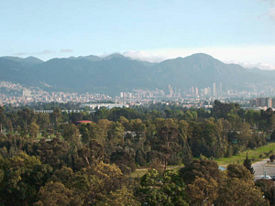 Surrounding hills, which limit city growth, run from south to north, parallel to the Guadalupe and Monserrate mountains. The western city limit is the Bogotá River; Sumapaz paramo borders the south and to the north Bogotá extends over the mentioned plateau up to the towns of Chía and Sopó. Frost usually occurs in dry season and during this period, the temperature falls below 0°C. The lowest temperature ever recorded was -8°C (17°F) inside the city and -10°C (14°F) in the nearby towns of the savanna. The urban layout dates to Colonial times, and is a square layout adopted from Spain. The current street layout has calles which run perpendicular to the hills in an east-west direction with numbering increasing toward the north, and toward the south from calle 1, and carreras which run parallel to the hills in the south-north direction with numbering increasing east and west from carrera 1. New urban sectors incorporate diagonal – similar to streets – and transversal – similar to carreras. Streets are numbered. Bogotá has over one thousand neighborhoods or divisions forming the developed urban network. Neighborhoods of higher economic status are primarily located to the north and north-east. Poorer neighborhoods are located to the south and south-east, many of them squatter areas. The middle classes usually inhabit the central, western and north-western sections of the city. 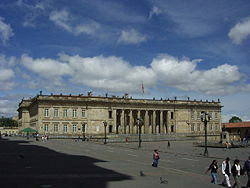 Bogotá is the capital of the Republic of Colombia, and houses the National Legislature, the Supreme Court of Justice, and the center of the executive administration as well as the residence of the President of the Republic. The Principal Mayor and District Council are responsible for city administration and are both elected by popular vote. 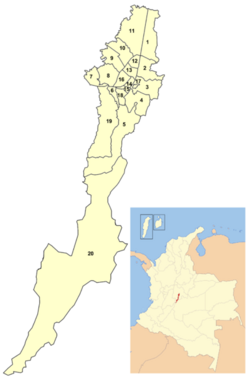 The city is divided into 20 localities: Usaquén, Chapinero, Santa Fe, San Cristóbal, Usme, Tunjuelito, Bosa, Kennedy, Fontibón, Engativá, Suba, Barrios Unidos, Teusaquillo, Los Mártires, Antonio Nariño, Puente Aranda, La Candelaria, Rafael Uribe Uribe, Ciudad Bolívar, Sumapáz. Bogotá is Colombia's largest economic center and the headquarters of major commercial banks, and to the Banco de la República, Colombia's central bank as well as Colombia's main stock market (established 1928). Because of its status as site of the country's capital, it is home to a number of government agencies, which represent a major component of the city's economy. Bogotá houses the military headquarters and is the center of Colombia's telecommunications network. Public services include energy, sewer and telephones. Energy and sewer bills are stratified based on the location of the residence. Thus, the wealthier sections of society help subsidize the energy bills of the poorer sections of society. The largest and most populous city in Colombia, Bogotá had 7,881,156 inhabitants residing in 2,262,251 dwellings in its metropolitan area according to the 2005 census. Central Square, National University of Colombia, Bogotá, D.C..
Bogotá has many public and private schools, universities, technical institutes, and language schools, among others. Its colleges and universities have a major impact on the city and region's economy. Not only are they major employers, but they also attract national and international industries to the city and surrounding region, including highly needed technology industries. 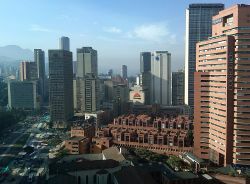 The city is Colombia's educational hub. The Teatro Libre International Jazz Festival, an internationally renowned jazz festival, is held annually in Bogota the first week of each September. World class musical performances including opera, zarzuela and operetta, interpreted by Colombian and international artists occur at the Colón Theatre, the Camarín del Carmen and Colsubsidio Roberto Arias Pérez Theatre. The Philharmonic Orchestra of Bogotá performs at the National University León de Greiff Auditorium. 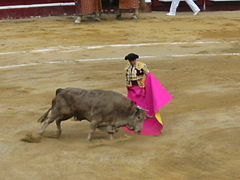 Bullfighting, originally introduced to South America by the Spanish, remains popular in Bogotá. Baseball and basketball have also become more popular in Bogotá and throughout Colombia. The only indigenous sport is tejo, a game derived from the Chibcha Indians, that is similar to quoits. The objective of tejo is to throw a small metal disk at a gunpowder detonator, with the winner determined by the number of explosions in proportion to the number of throws. Several festivals or fiestas celebrate occurrences of local importance and are often government subsidized. They promote and preserve popular tunes and dances as well as traditional costumes. The pre-Lenten Carnival is celebrated nationally. The Bogotá Carnival (Spanish: Carnaval de Bogotá) commemorates the founding of the city, and is a combination of various cultural events including masquerades, dances, and parades and others. The Iberoamerican Theater Festival held in Bogotá every second year and is one of the largest theater festivals in the world. To most Colombians, the primary rites of the church such as baptism, first communion, marriage, and extreme unction are the turning points in the life cycle and identify them as a social being. One's Catholic faith is considered to be a part of a person's cultural heritage and, like one's language, is passed on to become an integral part of a person's being. Close personal relations with members of the religious hierarchy were often maintained by members of the upper class and the upper middle class. The majority of the clergy was of upper-class or middle-class origin and therefore shared their interests and attitudes and felt a close affinity with them. In addition to providing most of the membership of lay religious associations, the upper social levels supported Catholic charities with their time and money. The church continues to exercise considerable influence in education, social welfare, and labor union organization. Catholic control over education in Colombia is probably strongest in Latin America. The church had its own Secretariat of Education responsible for more than 3,500 schools and universities. The church system was estimated to include over 85 percent of the students in preschool, 20 percent of those in the primary grades, more than 50 percent of those in secondary school, and almost 40 percent of those in universities. Church institutions of higher education were among the most highly respected in the nation. Bogotá has an extensive modern transportation system comprising in excess of 15,000 buses, busetas (medium size buses), colectivos (vans or minivans), taxis and the Transmilenio (92 articulated buses implemented in 2001). Buses are the main means of mass transportation. Bogotá is also a hub for national and international bus routes with the main terminal serving routes to the majority of cities and towns in Colombia and international services to Ecuador and Venezuela. Bogotá's main airport, Aeropuerto Internacional El Dorado, handles all domestic and international flights. In 2007, a major expansion was begun that will expand the airport's capacity from the current 8 million passengers per year to 16 million passengers per year. A smaller airport, Guaymaral Airport, serves as a base for Police Aviation and all general aviation activities. ↑ James D. Henderson, Helen Delpar, Maurice Philip Brungardt, and Richard N. Weldon, A Reference Guide to Latin American History (Routledge, 2000, ISBN 978-1563247446), 61. ↑ Bogotá una ciudad Andina (in Spanish). la Alcaldía Mayor de Bogotá.. Retrieved March 16, 2012. ↑ 2005 Census (in Spanish). Departamento Administrativo Nacional de Estadística DANE. Retrieved March 16, 2012. ↑ 4.0 4.1 Fodors. Colombian History Retrieved November 10, 2007. ↑ S. Arias and M. Meléndez, "Sacred and Imperial Topographies in Juan de Castellanos's Elegías de varones ilustres de Indias" in Mapping Colonial Spanish America: Places and Commonplaces of Identity, Culture and Experience. (Bucknell University Press, 2002, ISBN 0838755097). ↑ 6.0 6.1 Bogotá City Hall History Retrieved November 10, 2007. ↑ World Facts. Bogotá Retrieved November 10, 2007. ↑ Encyclopedia Britannica. Bogotá, Colombia Retrieved November 10, 2007. ↑ City of Miami. Bogotá, Colombia Retrieved November 10, 2007. ↑ DANE. Censo General 2005 Resultados Area Metropolitana de Bogotá Retrieved November 21, 2007. ↑ Library of Congress Country Studies. Race and EthnicityRetrieved November 10, 2007. ↑ Comunidad Segura. Bogotá’s success story Retrieved November 10, 2007. ↑ Shelley de Botton, February 14, 2007. Bogotá: profiling a security plan that is integrated and participatory Comunidad Segura. Retrieved November 21, 2007. ↑ Hugo Acero, August 12, 2006. Bogotá’s success story Comunidad Segura. Retrieved November 10, 2007. ↑ U.S. Department of State. June 4, 2007.Travel Warning Retrieved November 10, 2007. ↑ Bogotá City Hall. Education Retrieved November 10, 2007. ↑ 21.0 21.1 Countries and Their Cultures. Culture of Colombia Retrieved November 10, 2007. ↑ Bogotá City Hall. General Information Retrieved November 10, 2007. ↑ Soaring Steps. Cumbia Dance History - Cumbia Historysoaringsteps.org. Retrieved November 10, 2007. ↑ CIA World Fact Book. Colombia Retrieved November 10, 2007. ↑ The New York Times Company - About, Inc. Religion in Colombia Retrieved November 10, 2007. ↑ Bogotá City Hall. Bogotá Health Services Retrieved November 9, 2007. This page was last modified on 29 June 2016, at 19:05.